It is unusual for a healthcare provider to ask the customer what they want. Many hospitals simply drop a new specialty center into the marketplace with the goal of filling empty hospital beds and keeping the surgeons and the operating room busy. But is that what the CUSTOMER wants? Conversely, Prizm Development believes in consulting the “customer." And that is exactly how the Prizm spine center model was created 25 years ago. Prizm’s multi-disciplinary spine center model was the result of more than 1,000 one-on-one meetings over 25 years with benefits managers at the nation’s largest employers; medical directors of the nation’s largest health insurance companies; and case managers and adjusters for workers compensation companies across United States, in large metro markets and in small secondary markets. All these entities had the economic responsibility for PAYING for spine care for their employees, their covered lives, and for reimbursing injured workers when they became permanently disabled from a back or neck injury. Secondly, for more than 15 years Prizm has been asking the back and neck patient what they liked and didn’t like about back treatment, what worked for them and what DIDN’T work. The results are based on perhaps the largest number of RN-conducted one-on-one interviews with back and neck pain patients 3 to 6 months post first visit to a spine center. Over 15 years, more than 3,000 patient interviews were done by phone by RNs during the production of Clinical Outcome Report Cards for these client spine centers. We learned first hand the frustration of patients being punted from one specialty to another across a city or region. The spine outcomes studies tracked patient severity at intake, including what percent of patients had herniated discs and if the patient had previous spine surgery elsewhere at the time of first appointment. The RN then tracked their treatment at a spine center — if the patient had spine therapy, spinal injections or spine surgery. The RN interviews tracked spine care outcomes related to improvement in functional status, relief of pain symptoms and reduction in use of drugs. So in summary, Prizm Development took the time to learn about the specific needs and concerns of those entities which manage the care of thousands of people statewide and the patients themselves. We learned that employers and payors were nervous about excessive spine surgery and excessive use of drugs — both of which raised the healthcare bill, while at the same time creating additional problems like failed back surgery and opiod addiction. Rather than a myopic, single silo approach of a single spine surgeon in an office by himself, we learned that employers and payors were interested in a spine center approach that emphasized a team of spine surgeons working with physical medicine specialists and spine therapists. From all these one-on-one interviews, we learned that employers and payors wanted nonsurgical treatment options first, like physical medicine and spinal injections, to prevent an unnecessary surgery. But then, if nonsurgical treatment options weren’t working, they didn’t want to protract care and create lifelong symptoms. Instead, these payors then wanted the patient to access fellowship-trained, spine-specialized surgeons (ortho or neuro) who used minimally invasive techniques to shorten the length of the incision, reduce time in the hospital, lessen blood loss and speed recovery with a less painful rehab. Patients likewise wanted the quickest way toward relief of pain symptoms. However, many were lured into masking symptoms with drugs or passive feel-good-but-cure-nothing massage and hot packs. Others fell victim to gizmos, gadgets and the hype of a magic miracle surgery. For the person with back or neck pain, they were often faced with a safari through a frustrating array of disconnected spine doctors, who didn’t communicate among themselves, and often disagreed about what was causing pain symptoms. Each stop along the journey, the back or neck pain patient had to start from the beginning and explain their story, their symptoms, to yet another cog in a very fragmented healthcare system. Medical directors of managed care plans across the country are concerned with the wide variation in treatment associated with back and neck pain care. Many believe that back surgery is performed too readily and that too many MRIs and injections are prescribed for patients. Other back pain sufferers may take a do-it-yourself approach and resort to medicating themselves with over-the-counter painkillers, back braces and magnets in a frustrating quest for pain relief. Depending on where they seek help, treatment could include a barrage of unnecessary or unproductive X-rays, MRIs, pills, ultrasound procedures, ice or heat treatments, surgeries, manipulations, injections, myelograms and discograms. Another problem is that surgery may be done by surgeons who don’t specialize in spine. This creates a higher risk of failed back surgery syndrome, where the patient ends up in a chronic pain center for perpetuity, undergoing costly procedures. This, unfortunately, is the frustrating scenario associated with back care. What is a spine center of excellence? Prizm's conclusion from all these interviews and spine clinical outcomes research was that patients — and payors — could benefit most from an integrated, non-biased, multidisciplinary spine center approach. But the buzzword “spine center of excellence” is a debated term. Certainly a spine center would imply a group of back doctors or care providers in a building. But what is a spine center of excellence? A spine center of excellence is not necessarily a big building or academic institution in our opinion. Because we’ve learned through research that patients can get lost in big buildings and care can be highly fragmented. Some of places can perpetuate excessive spine surgery and the byproduct of failed back surgery. Bigness is not an indicator in our opinion, especially when we’ve seen some small spine center teams create excellence in spine care with great clinical outcomes with a very tight, hands-on collaborative approach to their patients. Care can be streamlined in these small but organized spine centers. A physical medicine MD can consult face to face with the spine surgeon on the next steps for a specific patient. Spine therapy can be provided 20 steps down the hall. And the spine therapist can collaborate with the physician team. A foundation based on a 3-legged stool of spine therapy (hands-on manual therapy with an exercise emphasis); physical medicine and rehabilitation specialists (PM&R doctors who use spinal injections to relieve symptoms); and spine-specialized surgeons. While this core team may refer out to other specialists, the team is essentially small and focused exclusively on spine. They communicate with each other and collaborate on the patient’s care. Rather than an “assembly line” approach, it’s a team approach. A philosophy of care that is common among the team members to emphasize nonsurgical treatment options in advance of surgery; to use an active rather than a passive approach to treatment and recovery; and to REDUCE use of opiods that simply mask symptoms rather than addressing the CAUSE of the symptoms. A belief that a well-educated patient influences the quality of healthcare and their compliance with prescriptions for therapy, exercise, weight loss, and non-dependence on drugs to mask problems. An emphasis on patient education to PREVENT FUTURE BACK ATTACKS. Just like a person receiving dental floss from the dentist after a filling, the spine center distributes an organized 36-page Home Remedy Book. This consistent education tool acts as a back owner's manual so the person understands what causes various symptoms and WHEN it’s crucial to go to the spine specialist to avoid permanent complications. Lastly, this organized Home Remedy Book for back and neck pain evangelizes patients on the importance of home exercise and special stretches that keep the back and neck flexible and resistant to future strain. Just as a person learns from the dentist the importance of brushing their teeth and flossing after having a cavity filled, the spine center educates patients on the CORRECT exercises for THEIR PROBLEM (stenosis, disc problems, ligament strain), and that they should do them daily to prevent future back problems. Where does spine surgery fit? The latest medical advances have made it easier for physicians to detect abnormalities in the spine. While this is helpful, the problem is that some abnormalities are simply a common byproduct of aging. For instance, some studies have shown that nearly half of healthy people over the age of 40 with no back pain whatsoever can have MRIs that would suggest disc problems. Secondly, many people also do not realize that nonsurgical treatment options for back and neck pain can yield similar long-term results to surgery. Although surgery can be the best option, many cases of back and neck pain can improve with nonsurgical treatments and home remedies. Many times, those surgeons who are biased towards surgery fail to share this information with the patient. A spine center of excellence has spine physicians that move patients through nonsurgical care adroitly, and if that fails, these physicians educate the patient to their surgical options for relief of symptoms so the patient can make a well-informed choice. Want to know more? If you are a physician group, health insurance company, employer, workers compensation carrier — or hospital service line director wanting to create a specialty center that appeals to the customer — we can be contacted through the online form by clicking below. Prospective patients please select a spine center from the network and email them directly at the individual contact forms or phone numbers. Be sure to mention you heard of their spine center through Spine Center Network. The goal of Spine Center Network is to provide helpful information to back pain sufferers, health insurance companies, large employers and work comp case managers who are looking for spine centers that emphasize nonsurgical options and spine-specialized surgeons who emphasize minimally invasive spine surgery and perform a high volume of spine surgeries to ensure proficiency. These spine centers are located in the following areas of the country: August Back in Augusta, Southeast Georgia; Baptist Health Spine Center in Little Rock, Arkansas; Center for Spine Health at University Orthopedics in Providence, Rhode Island; Georgia Comprehensive Spine in Athens, East Georgia; Kenai Spine in Soldotna / Kenai / Anchorage, Alaska; Maine Spinecare in Auburn, Maine; Northwest Florida Spine in Panama City, Florida panhandle; Precision Spine Care in Tyler, East Texas; Ortho Illinois Spine Care in Rockford and Chicago area, Illinois; Reading Neck & Spine Center in Reading, Central Pennsylvania; The Spine Program at Ascendant Orthopedic Alliance in South Bend and Elkhart, Indiana; South Carolina Spine Center in Greenwood, western South Carolina; Spine Group Alabama in Birmingham, Alabama; and Spine Nevada in Reno, Sparks, Carson City, Nevada. Some of these spine centers are destinations for medical tourism, attracting patients from other countries like Canada or Mexico. 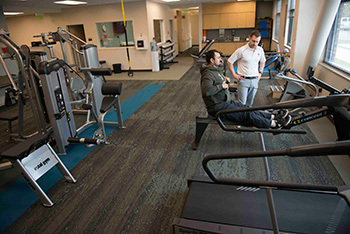 Some of these spine centers provide care under bundled predictable rates.